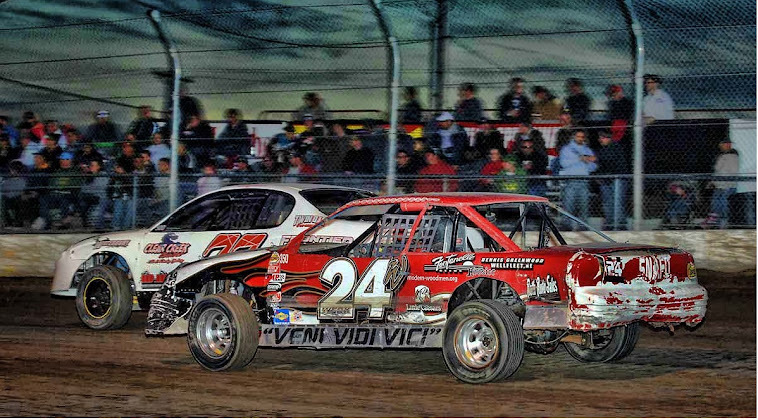 Dubuque, Iowa – I was speaking to one of my fellow racing enthusiasts not too long ago and the subject was the Deery Brothers Summer Series for IMCA Late Models. “I see they have another show scheduled at Dubuque on Sunday, July 15th, I may have to go check that out,” I remarked. “As far as I’m concerned, they should schedule five or six Deery shows at Dubuque, they put on the best show every time,” replied my racing devotee. After last night’s show, I couldn’t have agreed more. 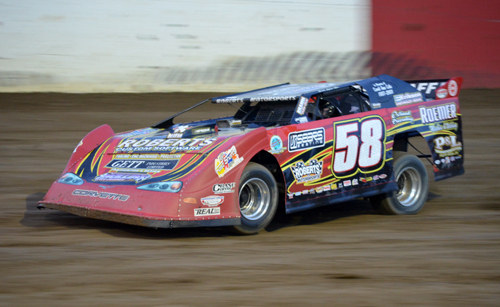 What some would consider IMCA’s showcase division, the Deery Brothers Late Models put their best foot forward on Sunday night and a new winner emerged on a decent night of racing. I watched Luke Goedert of Holy Cross Iowa progress over the years into a fantastic driver, and he’s gotten better and better with more time behind the wheel. 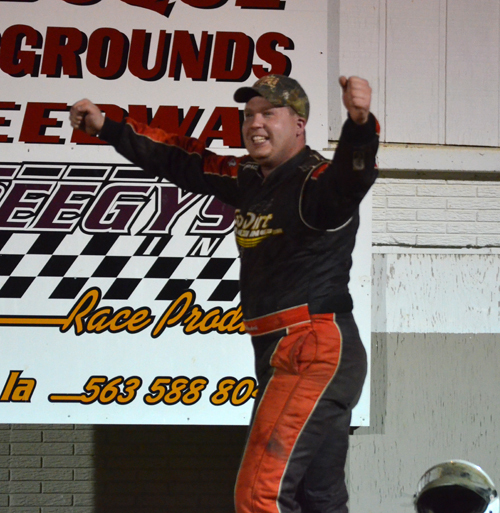 Last night, he reached a pinnacle in his young career, winning the 35-lap main event at the high-banked 3/8-mile dirt oval. His previous best finishes in Deery competition were a couple of fifth place finishes. Goedert not only won the race, he smoked ‘em. The young man, who races at Dubuque on a weekly basis, was simply in another stratosphere last night, taking the lead at the drop of the green and never letting off the gas. He certainly had talent behind him in Jeff Aikey, Jason Rauen and Ray Guss Jr., but no one was going to catch him on this night. They could have run 50 or 100 laps and I don’t think anyone would have caught Luke “Go-Go” Goedert. He had his ride set up to near- perfection, running the high side of the track in flawless manner. In other words, he put on a racing clinic…he showed ‘em all how you win at Dubuque. For me and I’m sure for most of the fans in attendance last night, it was nice to see a new face in victory lane last night. And as long as I’m giving out kudos, I have to show some love to Ray Guss Jr. as well. Guss, who couldn't get it together in his heat race, was forced to use a rare provisional to get into the 24-car field. Starting 22nd, Guss showed why he’s at the top of the late model game, by slicing and dicing through a talented field to finish a strong fourth. Who knows what the outcome would have been tonight if the Milan Flash had been positioned closer to the front where he’s accustomed to starting. This was my first visit to Dubuque in a couple of years and I always remembered how dark it was on some areas of the track, but not anymore. The new lights that were installed a couple of weeks ago shown brightly and the fans really get the big picture during the racing action. From a photographer’s standpoint, it’s a huge help as well. Several shooters in attendance last night remarked how big a difference it makes. Congrats go out to the Dubuque County Fairboard for a job well done. It really makes what was already great track, a notch better now. The IMCA Modifieds, while strong in numbers, had a tough go of it last night with multiple cautions throughout their 20-lap feature. What could have been a great duel between veteran Ron Barker and Ryan DeShaw never got into a proper rhythm because of all of the stoppages. 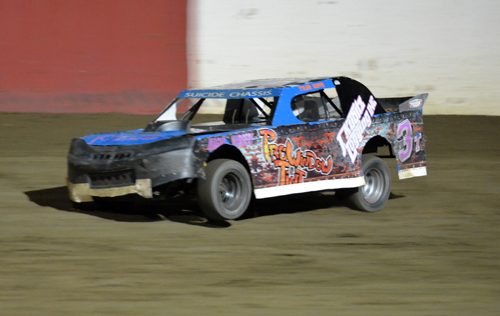 Still, DeShaw and Barker did manage to do their best, as they both took to the high side of the track and showed why they’re two of SPI’s top modified hotshoes. DeShaw, despite all of the yellows, got past Barker just before midway through the contest and managed to hold him off and seize a hard-fought win tonight. I saw Austin Moyer win an IMCA SportMod feature at Independence a few weeks back and came away impressed on his driving abilities. He apparently hasn’t lost touch with those abilities, winning the feature here Sunday night. The SPI Stock Cars are never a dull moment. A few heated words in the pits between two of the spirited competitors after heat action made it all that more interesting come feature time. Tyler Soppe took the victory tonight. 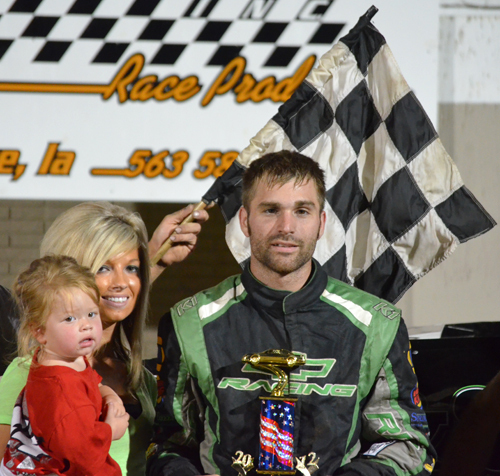 It was a whimsical evening of racing at the Dubuque County Fairgrounds on Sunday night. My colleague was absolutely right about the Deery Brothers Summer Series at Dubuque…they should do it again…and again…and again.